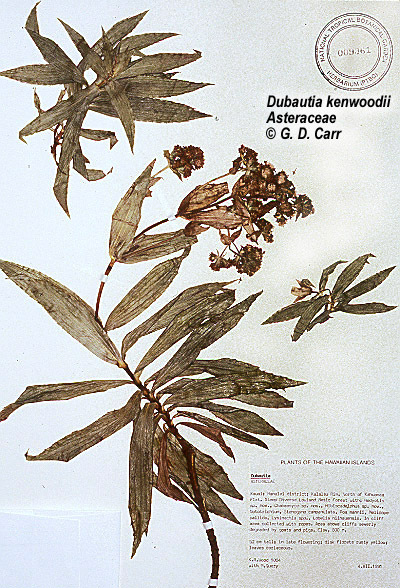 Dubautia kenwoodii is a small shrub about 5 dm tall; the leaves are opposite. 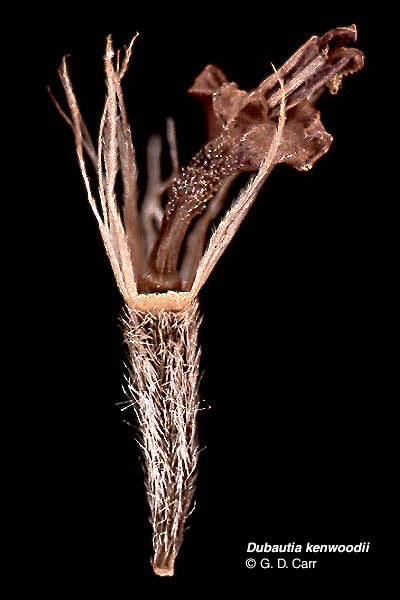 Diagnostic features of the species include the combination of uniseriate, peripheral, very firmly coalescent receptacular bracts, cymose-glomerate capitula, and coriaceous, lustrous leaves with sharply cartilaginous-toothed margins and abruptly narrowed, broadly clasping bases. Based on the single known collection, flowering appears to occur in June. This species of the Hawaiian silversword alliance is known only from the Holotype, collected on the rim of Kalalau Valley, N of Kahuama'a Flat, Kaua'i. Its habitat is a steep, diverse Lowland Mesic Forest at 800 m elevation. Last Modification: June 5, 1999. Holotype, Wood & Query 1004 [PTBG]. Portion of Holotype, Wood & Query 1004 [PTBG]. Note broadly clasping leaf bases and sharply toothed leaf margins. 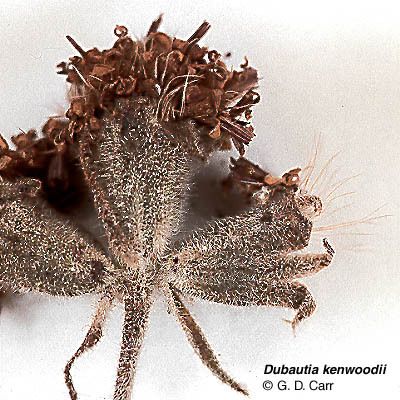 Flowering heads of Holotype, Wood & Query 1004 [PTBG]. Note uniseriate, strongly coalescent peripheral receptacular bracts. 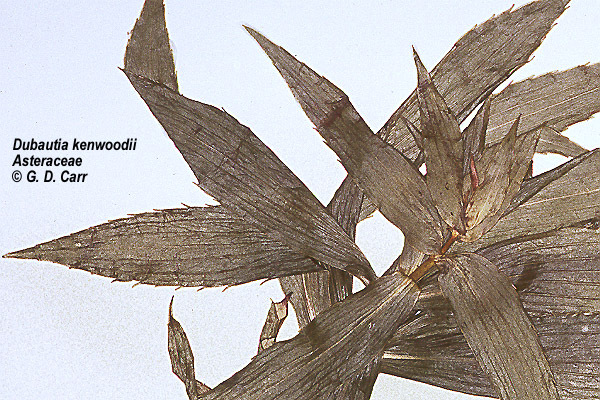 Floret from Holotype, Wood & Query 1004 [PTBG]. Note glands on upper portion of tubular part of corolla. Some pappus bristles were removed so the corolla would be more visible.